In the early 70s I began my musical career with a band I formed called Ice. I had two lead guitarists at that time, myself and Steve Holland who, along with Dave Hlubeck went on form the band Molly Hatchett. I played with Molly Hatchett for a year and was the arranger of their version of Dreams. I really wanted to pursue reggae and smooth jazz so left Molly Hatchett, relocated to New Smyrna Beach and formed my own band Lionheart in 1992. That same year we landed the house gig at Conchy Joe's in Melbourne which is now known as Squid Lips. We were therefor five years until we left to perform at Margaritaville in Universal Studios where we played for two years. Now you can see the band playing from St. Augustine to Key West. 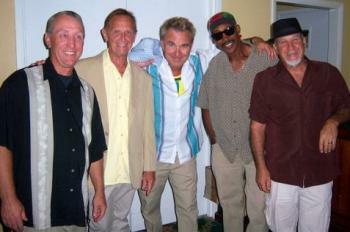 With the band is Alex Adams, long time West Indian lead vocalist, Chester Murray of Trinidad, lead vocals & drums, Dan Dennis of Miami on bass guitar, and Bobby Zacconi of New York city on keyboards. One thing I was lucky to do is to jam and play Lucille with BB King at the age of 16. Please note on our website there are 3 music files you can listen to, LIONHEART IN THE STUDIO, MARKO & STEEL DRUMS, and LIONHEART DOING THEIR THING. Click above to like us on FaceBook!